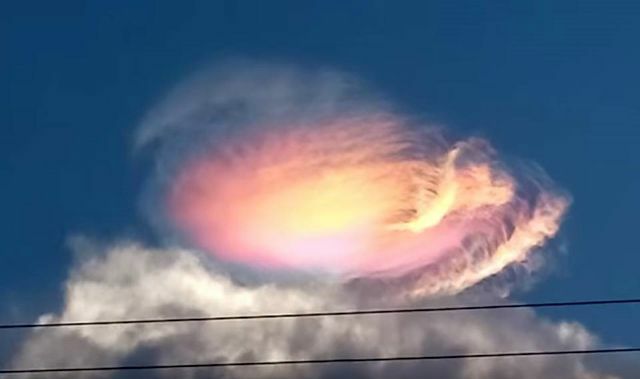 For a moment I thought it was a UFO hidden in a colorful cloud formation but the spectacular rainbow cloud in the sky over Caxias, Brazil is a phenomenon known as an iridescence cloud. Iridescent clouds, known as "fire rainbows" or "rainbow clouds," occur when sunlight diffracts off water droplets in the atmosphere, mostly seen at cloud edges or in semi-transparent clouds, and newly forming clouds. The amazing cloud was filmed by Oliver Lima on December 6, 2016 who posted the original video on Facebook.